All Grids in DonorSnap are designed in a similar fashion, allowing you to easily learn the software and navigate through your data. Here is the Main Contact grid (Community > Contacts). Modify the number of records per page to show up to 100 records per page. Use the scroll bar or your mouse scroll wheel to quickly move through your data. 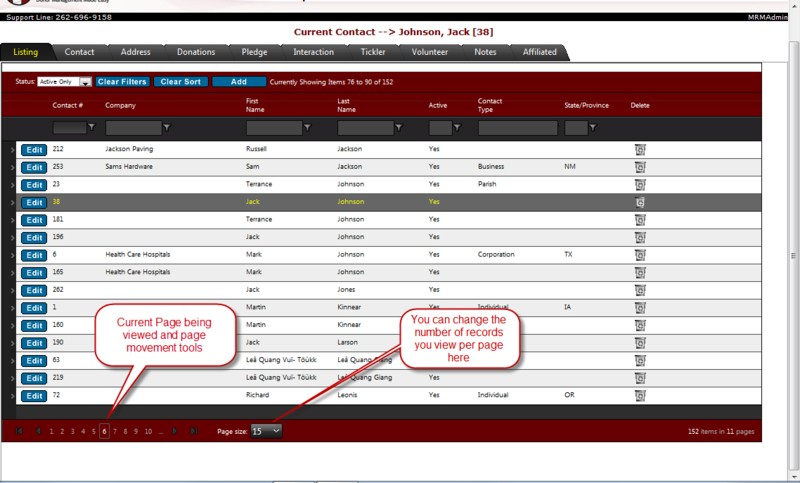 On the bottom left hand portion of the screen, select a specific page to jump to or use the forward/backward icons to page thru your data. Sort records using any of the grid columns. Click on a column heading and the data will be sorted “Ascending” and a “^” symbol will show up by the column name. A second click will sort the data “Descending” and a third click will return the data to its original order. If you apply sorting to one column and then a second, the data will first be sorted based upon the value from the first column, and then the second column in a layered sort similar to sorting in Excel. Click Clear Sort to return the list to its original order. Filtering helps you navigate through your data to find a specific record or group of records. Filter by any column (choose available headings under Home > User Settings). Type in the data or portion of data that you wish to look for in the appropriate Filter Box. Click on the Filter Icon (teeny drop-down arrow next to the heading title) to bring up your filtering choices. The most common choice, and default for DonorSnap, is Contains. 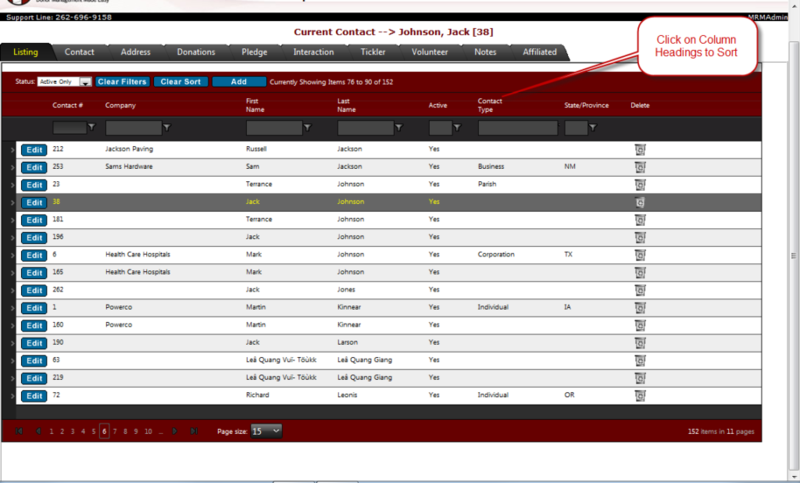 For example, this option will allow you to type in a portion of a name and then find all potential matches within your database very quickly. Search for a specific match (“EqualTo”) or look for records with no data “IsEmpty” or “IsNull”. These are two similar sounding searches but have a different purpose. “IsEmpty” will identify records where you did import blank data into a field. “IsNull” will identify records that have never had data entered into a specific field. To remove a filter choose the option, “NoFilter” or click on the blue Clear Filters button on the top of the grid. 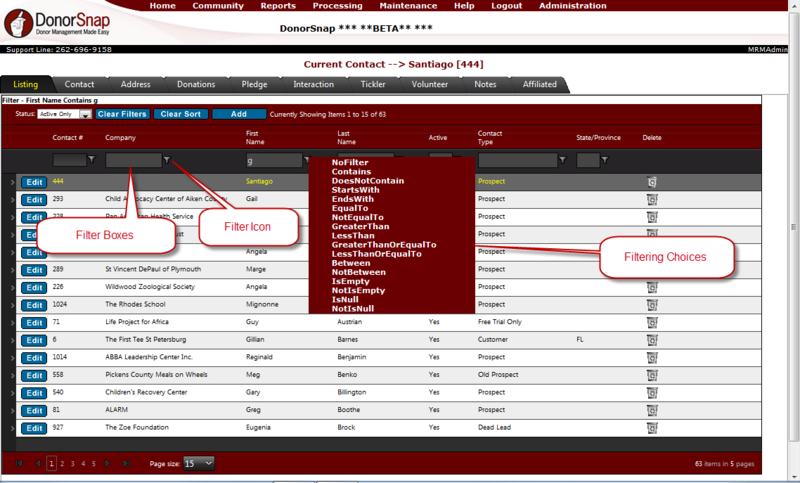 Multiple filters can be layered and only records that meet all filter criteria will be displayed. Up to 20 columns of information can displayed on any grid. Customize the visible fields under Home > User Settings to create different grids for all your users. Create the default grid for all users under Maintenance > Site-Setup > Screen Layouts. Modify the widths of the columns by slowly moving your cursor between column headings until you encounter an arrow. 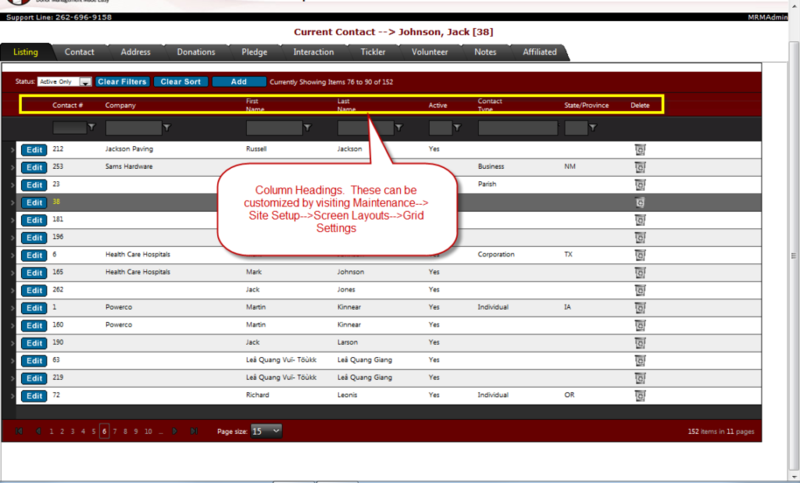 When you do encounter the arrow, hold the left mouse button down and drag the arrow to create the column size that you desire. Note – Column width settings will only be maintained until you leave the screen. The default will return the next time you open this screen.